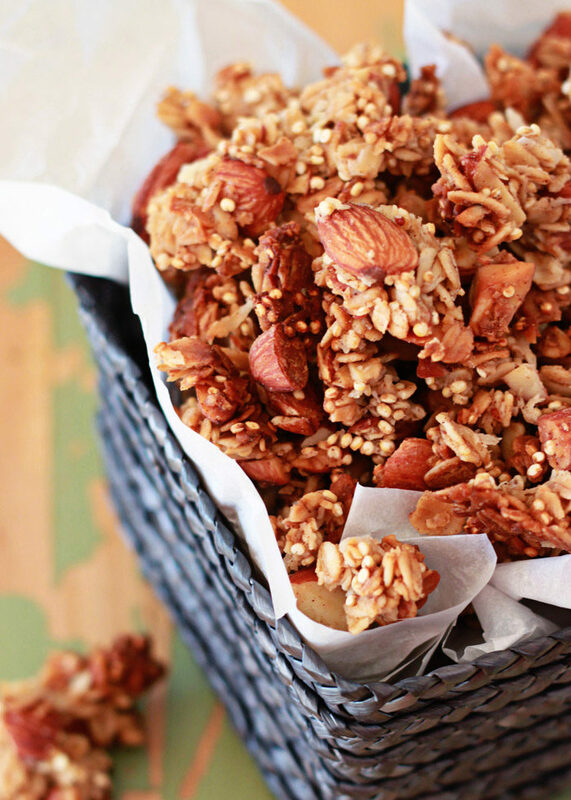 Crunchy clusters of honey-sweetened goodness. Okay, so. ‘Fess up time. I’m going through a bit of a blogging rough patch. For one: every recipe idea I have lately ends up being a dismal flop – so, of course, they don’t see the light of day here. Apparently vegetarian Irish stew (gross), sweet-potato-topped chili shepherd’s pie (boring), and sweet potato biscuit breakfast sandwiches (weird) are simply not meant to be foodstuffs. At least not by my hand. And then add in the dietary restrictions I’m currently on, the dietary restrictions my daughter is now on, and the dietary restrictions I’m likely about to be on because I’m still having annoying little health issues and need to figure out what the h-e-double-hockey-sticks is going on. Seriously, man. Ugh. I’m trying to keep this from full-on venting but I just want to be up front. I’m trying! 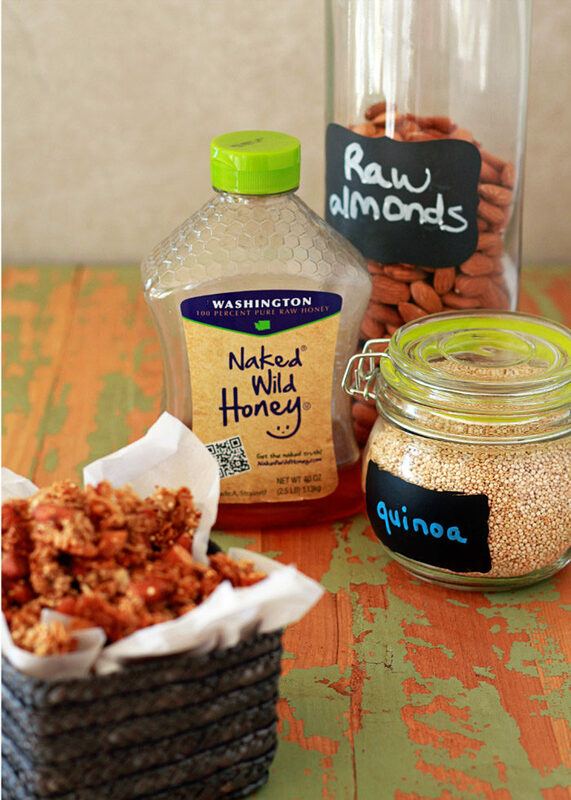 And I am, for what it’s worth, pretty dang excited about this Honey Almond Quinoa Granola recipe. Of course, I did come up with this recipe months ago, when my kitchen mojo was flowing a little better. Grr. So! 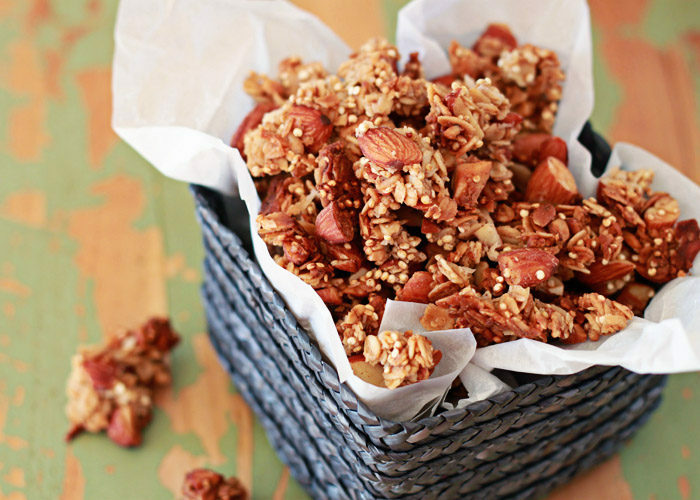 How’s this granola different and awesome? Well, I’m sure you noticed the word “quinoa” up there in the title. Quinoa is great to add to granola not only because of the added protein and omegas, but it also lends a nice little extra crunch. 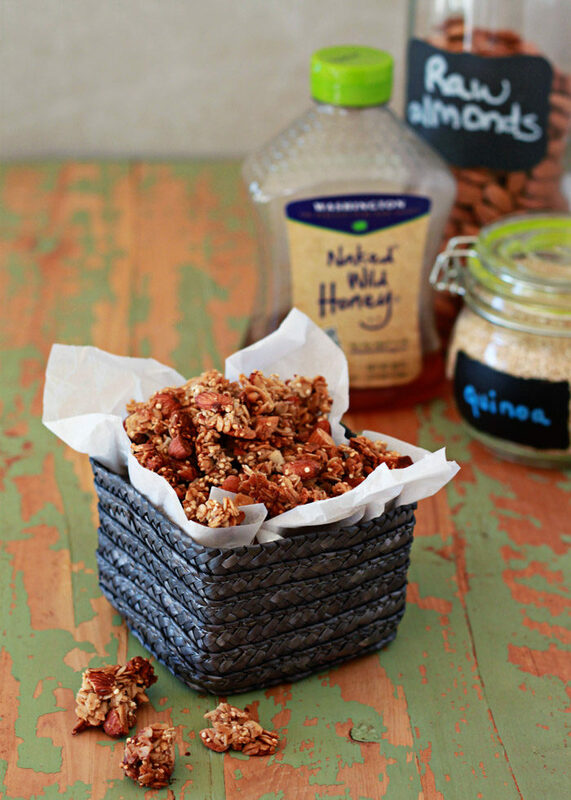 Honey sweetens this batch, but this granola isn’t overly sweet or sticky – it doesn’t feel like fattening granola. It feels like good-for-you granola. It’s true! There can be such a thing! At least, I think so. And in moderation and all that. 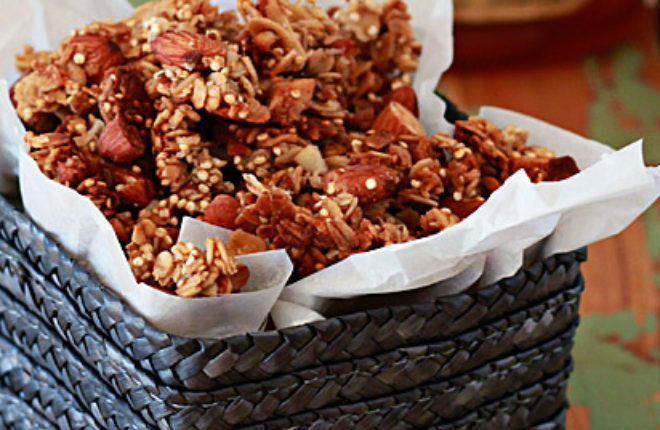 I like this granola without any dried fruit, but you’re welcome to add some if you’d like. Make it yours! I’ll just be over here in the kitchen looking around for my mojo. Maybe I’ll start by digging through this bowlful of granola. Win/win! Preheat oven to 325 degrees Fahrenheit. Line a large rimmed baking sheet with parchment paper. To a small pan over low heat, add the honey, coconut oil, cinnamon, and salt (if using). Heat, stirring occasionally, until melted and thoroughly combined. Remove from heat. Stir in the vanilla. Set aside. In a large bowl, stir together the oats, quinoa, almonds, and coconut. Pour the wet ingredients over the oat mixture and stir until well-combined. In a small bowl, beat the egg white until frothy. Add to the granola and stir until very well combined. 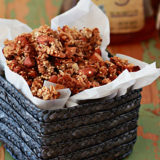 Pour the granola into the baking sheet and bake until golden brown and fragrant, 35-45 minutes, opening the oven to stir the granola about 20 minutes into the cooking process. Remove from oven and let cool completely. Break into bite-size chunks. Mix in dried fruit, if using. Stores well in an airtight container at room temperature for several days. Nutrition information is an estimate. I am not a nutrition expert! Because I am paying more attention to nutrition info myself these days, I thought I would share (it helps me for future reference too!) I used the Calorie Count tool to calculate this information.